Little Giant VCMA Series is ideal for collecting, detecting, and the automatic removal of condensate from air conditioning equipment, de-humidifiers, high efficiency furnaces, condensing boilers, and other equipment where an automatic drain pump is required. The company that has always been the forerunner in condensate removal pump design introduces the new generation VCMA Series. Adding features for every installation with guaranteed serviceability and unmatched reliability, Little Giant once again defines state-of-the-art in pump design. Our newest in condensate pump technology. A slimmer footprint... an oil resistant tank and check valve that eliminate the problem of cracked tanks exposed to oil... and numerous other features. Our newest in condensate pump technology. A slimmer footprint... an oil resistant tank and check valve that eliminate the problem of cracked tanks exposed to oil... and numerous other features. The VCMX-20ULS-C comes with an anti-sweat sleeve for areas of high humidity, where significant amounts of condensation can build up on the outside of the tank, causing water damage. Only Little Giant's NXTGen pump comes with an anti-sweat sleeve to eliminate sweating. Designed for in-pan placement, the 1-ABS shallow pan pump offers next generation technology for air conditioner condensate removal. Totally submersible pump with built-in, advanced non-mercury mechanical switch that automatically triggers operation when condensate in the pan or reservoir reaches a preset level. Automatic shutoff occurs when the condensate level drops. Low weight, compact size, high lift and quiet operation make the Little Giant line of ABS pumps perfect for in-pan condensate and other wastewater removal. Designed for in-pan placement, the 2-ABS shallow pan pump offers next generation technology for air conditioner condensate removal. 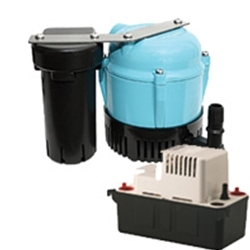 Totally submersible pump with built-in, advanced non-mercury mechanical switch that automatically triggers operation when condensate in the pan or reservoir reaches a preset level. Automatic shutoff occurs when the condensate level drops. Low weight, compact size, high lift and quiet operation make the Little Giant line of ABS pumps perfect for in-pan condensate and other wastewater removal. Designed for in-pan placement, the 3-ABS shallow pan pumps offer next generation technology for air conditioner condensate removal. Totally submersible pump with built-in, advanced non-mercury mechanical switch that automatically triggers operation when condensate in the pan or reservoir reaches a preset level. Automatic shutoff occurs when the condensate level drops. Low weight, compact size, high lift and quiet operation make the Little Giant line of ABS pumps perfect for in-pan condensate and other wastewater removal.